The Final Prayer; "Good Bye"
We have now come to the end of my time with the good people of St Paul’s Church in North Andover. As you prepare to receive your new priest Sarah Kelb, so now you and I must prepare our hearts to say Goodbye. To say “Goodbye” is not to say I’m leaving; it is to ask a prayer. So too, I must say to you one and all; “Goodbye” which is to say, I pray for you in exactly these terms; “God be with you”. You must love one another with all your hearts, all your souls, all your mind and all your strength. That is who God is. God is Love. You cannot say you love God unless you love one another. And if you want to love God, then begin by loving one another. In our own time as we are fed and nourished by the Eucharist each Sunday we might ask ourselves the same question; “What is it?” Is this the body of Christ? 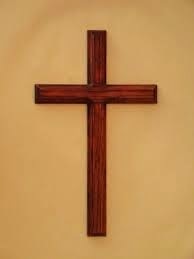 Is it a symbol of Christ’s Real Presence with us? 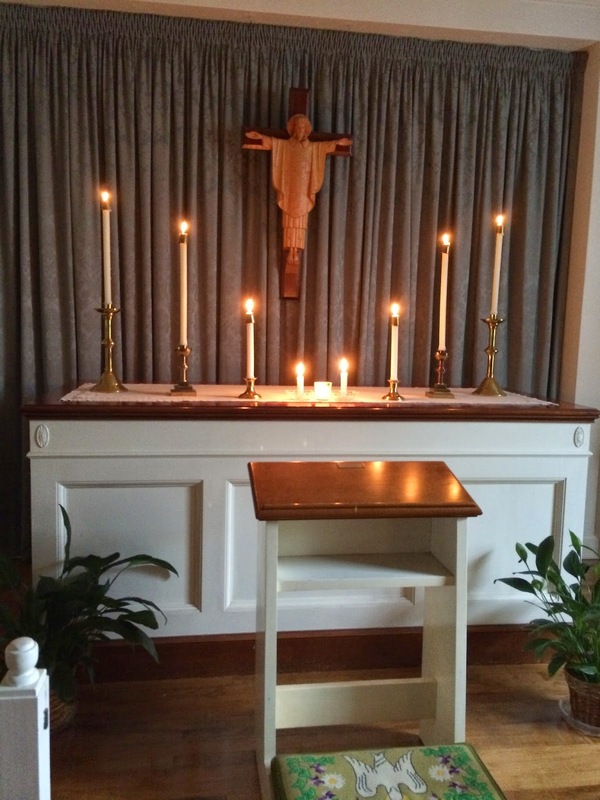 Is it focused on the Bread and Wine, or the Scripture, the Prayers of the People, the moment when we come to the altar rail or when we leave the church to make a better world? Is it in the entire mystery of gathering and being sent out again? God feeds us today as he did the children of Israel long years ago with Manna in the wilderness. In today’s Gospel we also heard of the Landowner who went out to hire laborers to work his vineyard for the day. They agreed on the wage for the day. But when he went out a little later on at 9 o’clock in the morning he found those idle in the marketplace and he sent them out to work the vineyard too. So too he went out at noon and three in the afternoon; and he said “What are you doing standing around here idle; go into the vineyard and get to work!”. Then again as the day was drawing to a close, he sent yet more workers into the vineyard at 5 pm. And when the time came to be paid, beginning with the last hired, he paid them all the same wage. This parable does not please economists and certainly flies in the face of sound business practice. It pleases me because if it were up to me I’d put every idle teenager in the inner cities and rural areas of this and all countries to work. Idle hands make for mischief and loss of hope. Loss of hope makes young people the targets of those who seek to do harm through crime, drugs, and extremism and terrorism…but I’ve already said that more than once. But this landowner, in the imagery of scripture, who does he represent? Perhaps God? This vineyard often represents Israel throughout the imagery of scripture and certainly does here. The folks standing idly by, that be you and me unaware of how urgent a matter it is for us to proclaim the nearness of the Kingdom of God. And the pay at the end of the day of course, is it none other than the Kingdom of God itself? It is the business of the love of God. “What is it?” we might ask might ask with the Children of Israel as they gather the “What is it?” that God provides. The business of God’s love gets turned upside down in unexpected ways as the first sometimes come in last and the last sometimes come in first. How do we make sense of it all? “Its complicated”, as the movie might say. I know its complicated. Love is complicated. Forgiveness is almost incomprehensible and impossible were it not for the presence of God in our lives. But then loving God with all of our heart and soul, and mind and strength...that takes everything we’ve got. And loving one another takes a little more. So get on with it. That’s the work of the people of God; to love one another. This is our “liturgia”, literally, the public work of the church. There is plenty of work to do in God’s Vineyard. Therefore you must love God. You must therefore love one another. Oh and, one more thing, you must love your new priest too. Just to make sure I go on record; you must love your new priest with all your heart all your mind, all your soul, and all your strength. Got that? 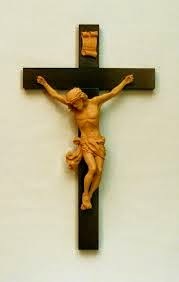 It is Holy Cross Day in the Church Calendar and that got me to thinking about Jesus: dead or alive. It got me to thinking about my dearest loved ones: dead or alive. Ultimately it gets me to thinking about all of us: dead or alive. This past week, I went to visit some dear friends in the Cleveland area where I served as a parish priest from 1983-1990. We were all younger then and I baptized a slew of babies there including Bob and Cathy’s triplets. There were weddings and burials by the score as well and it was during my time there that we designed and installed a columbarium. As it turns out one of the members of that congregation is very sick now and is much older, well into his 90’s. Not an easy time of it for him. And Cathy has suffered a massive stroke too. And I couldn’t let the time come and go without a visit to both of them and some other family and friends. As I drove the more than 600 miles between home and Cleveland I became aware of the fact that it was a journey that united many memories, many places, and many people. My life is and has been an abundant one. I thought of my Toronto years, mom, HK as we called my step father, my brother Jim, school chums, Seminary days, and then of course my life at Epiphany, Euclid, where Cindy and I lived and our children were young. There were the hundreds and thousands of miles along I-90 and the New York State Thruway. It was a journey that required many prayers, and a sense that God is with us in and through every mile. As God is with Don and his family and friends, and as God is with Cathy and her family and friends. It is a journey that requires many, many prayers. I remember very well being at Epiphany and the joys and sorrows of being there. It was there that I discovered how to manage a “New Member Ministry” paradigm that gave much life to that congregation. It was while I was there that I discovered that I was bi-polar, and none of us really knew how to handle mental illness at the time. Jesus got us though all that and has brought us to this new day. I wondered as many of us might, how many times are we to forgive one another? Shall we forgive shall we say 7 times? You know the answer to that one, “NO! You shall forgive seventy times seven. I know that today’s translation says seventy seven times…but the point is the same; the essence of spirituality is Forgiveness. It is in the nature of a full and abundant life that Jesus intends for us that we will live lives that are forgiven and forgiving at the same time. As today’s Gospel makes clear, in the same way that the King generously forgives his servant, so too that servant is under the same moral mandate to forgive the one who owed him a fraction of his former debt. When I served at the Church of the Epiphany, in Euclid, Ohio, I began every Sunday morning celebrating the Eucharist in the Chapel. Over the altar in that Chapel there was a Christus Rex, for me the most beautiful Christus Rex I have ever seen. The Christus Rex pictures Jesus in his Risen Glory, on a cross, crowned in victory and robed in glory. This is how the Early Church pictured Jesus. Not on a crucifix in agony and in death, as the church of the high middle ages imagined him, not an empty wooden cross as much of the Reformed Church sees him…but as the Risen One in Glory…the one who rose victorious over sin and death. This is how I picture Jesus. Cindy and I had a chance to visit Epiphany this week while we were in Euclid. We got a chance to meet the new priest. I took some photographs of the church, a very beautiful Colonial building. And then of course I went to the chapel. Four candles were lit on the altar there, and the Christus Rex stood out by the candle light on a typical cloudy Cleveland day. I snapped a few shots of the cross with Jesus crowned in Glory robed in a chasuble of the resurrection. How interesting that this is how the early church pictured Jesus. Mind you they were closer to the reality of the Risen One than we are. They were with him on the night he washed their feet and instituted the Eucharist as that meal designed to make him known to us for all time. He told us this one simple thing; love one another! They saw the trial and crucifixion and watched him die. The women went to the tomb on that first Easter morning and discovered it was empty. Lo and behold the gardener Mary saw was not there to trim the trees but to pierce through what we thought was the power of sin and death. They saw him in the upper room. Even Thomas touched the wounds on his hands and side. My Lord, and my God, he said! He is alive. 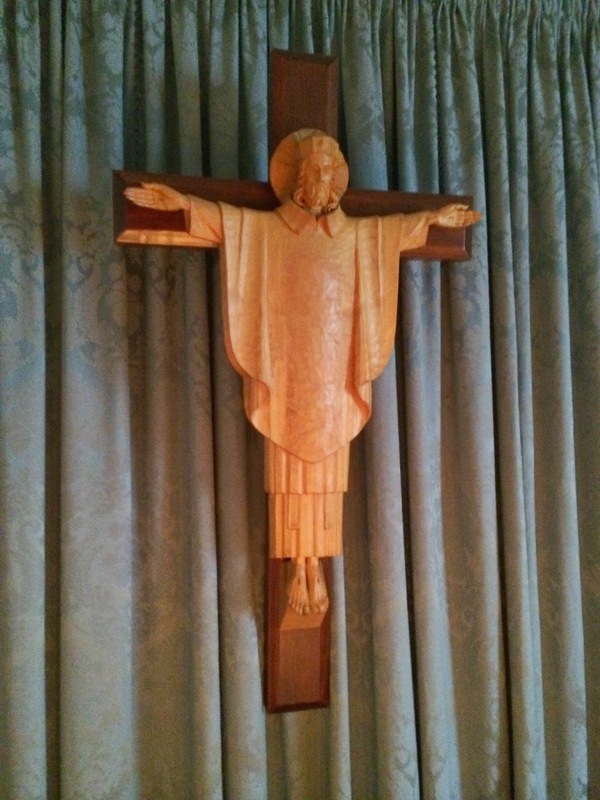 No matter how many baptisms, weddings, hospital calls, or funerals I did at Epiphany, I came to the altar on Sunday morning and smiled with the joy of faith when I saw that Christus Rex, the Risen Christ in Glory. I wanted then what I want now. Jesus: Dead or Alive. Or perhaps more precisely, I want Jesus Dead and Alive. As he lives a life like he lives so I too want to live like him. As he dies a death like he dies, so too I want to die with him. As he rises from all the power that sin and death has in life so too I want to rise with him. This is why I am a Christian. Don and Cathy are struggling with their challenges just now in this life, as we all are. They have decided to dedicate their lives to Jesus. You and I have decided to dedicate our lives to Jesus. I have a Facebook friend in California who refers to himself as a devout Episcopalian. Funny, I thought, you don’t see that turn of phrase on Facebook very often, but it pleased me when I saw it. Last week I invited you all to become pillars of the church as you prepare to greet your new priest. As of yesterday we have a new Bishop too! Lets be pillars of the church for our new priest and our new bishop and for one another. Above all let’s be pillars of the Church for Jesus, the Risen One, the Christus Rex as we greet with joy this feast day of the Holy Cross. The world is still waiting for peace and justice. The world cannot have either until it too gets to know something about the Love of God that we meet in Jesus, the Law of God as we have received it from Moses, or the Mercy of God as we know about it from the Holy Koran. The world cannot have Peace with Justice until we all learn to love and respect one another. As a boy I had to pray for the Queen of England in the Anglican Church of Canada for 11 long years. This was a challenge for a kid born and brought up in Boston. But I grew to love and respect the folks in Canada. They gave me a very good education and universal singly payer health care beginning in 1967. The time came for Cindy and me to leave Cleveland early on Friday morning. We had a long day ahead of us. I thank God for our love. We have our best visits during those long, long rides. We dream our dreams, hope our hopes, and call to mind our memories. We also say our prayers for Don and Cathy. We visited Ward and Suzie and their daughter Abbey and her new baby boy Elliot while we were there. What a joy! There is much to think about as the ribbon of highway stretched out before us. And so I always come back to a prayer that sustained me lo these many years. Come Lord Jesus and be our Companion along the way. Kindle our hearts and awaken Joy, that we may know you as you are revealed in Scripture and in the Breaking of the Bread. Come Lord Jesus. Amen. 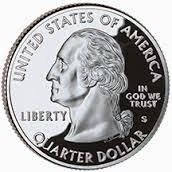 So says the coinage of the Republic. The collect of the day teaches us to trust in God with all our hearts. And there are two reasons for that; firstly, God resists those who put their confidence in their own strength, and secondly, God never forsakes those who make their boast in the mercy of God. Certainly we see evidence of that in Sacred History. Today, for instance, in our First Lesson we read of God’s ordinance regarding the institution of the Passover meal. The ritual of Passover is a reenactment of the means by which we came from slavery to freedom. 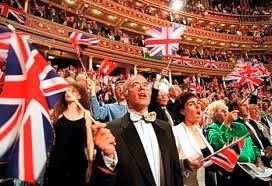 Ah there’s nothing quite like the Proms. We have the Pops, but the British have the Proms. Either way what fun! Most economists note that in the current history of America, the only place where income in increasing significantly is in the top 1% of the population. You will remember that Pharaoh was worried about the number of Hebrew people in the land and decreed that the male children would be killed. One of those children got away as we already know from the cycle of readings around the life of Moses. 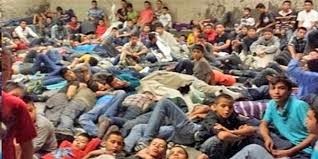 Then there were too many Hebrew children, now we have millions of illegal aliens and children without parents invading our shores from Central America. Like we did when the Irish and the Italians who invaded before them, we posture ourselves politically against the inevitable. People go to Pharaoh again and again seeking a place in the sun. Whether it is citizenship or a raise in the minimum wage or just a job, the powerless will always be met with the same response from those with the power. NO! I see slavery in our young people today here at home in America, and abroad as well. I ache for our young people, whether in the teeming inner cities of our nation, in rural areas or the middle east. If they do not have an opportunity to find their way toward economic freedom, they will be forced into a life of crime, waste away into a life of drugs abuse, or turn to a life of violent terrorism, which at least promises them all the rewards of heaven. I would argue that it is a dangerous posture for us to allow our young to languish in a kind of modern variation of slavery and oppression. I’ve spent a lifetime in the cities and in the rural areas of this country and I can tell you chapter and verse about the hopelessness of these young people. Take away hope, and you take away everything. If you grow up in my family or in my church you will find out it what it is like to be loved and educated and equipped for life in this world. You will make a contribution to the creative, redemptive and sanctifying work of God. If you grow up in my home, God help you! That’s the foundation of all faith. God created us. God brought us out of slavery and into freedom. God sent Jesus to be for us the Way, the Truth and the Life. Jesus gave us the Church as the Community of Faith where we might live out our faith. And The Resurrection of Jesus establishes the Hope in which we all live both in this life and in the life to come. If you take away our hope, or if you take away the church or Jesus, if you take away a sense that God has made us, then, sure as Mike, we’ll fall back again into slavery. I suspect that many of our young people are losing all sense of meaning, purpose and perspective in life. If there are no jobs, if there is no future, no purpose, then there is crime and drugs. If there is no hope for the young in the Middle East, they become prime targets for those who wish to wage Jihad or “Holy War” against the Western World. After all, the Western World has turned toward secularism and away from God, and though I understand why many turn away from religious zealots. What I do not understand though is the growing concentration of wealth in the few. I object to the redistribution of wealth from the the 99% to the 1%. It is a posture of greed. A posture of greed is very dangerous both domestically and internationally. In today's Gospel, Jesus teaches us to take the case directly to the one who sins against you. If that doesn’t work bring a few respected leaders with you and seek some kind of accommodation. If that doesn’t work set the matter before the church and if that still doesn’t work treat the offender as you wold a tax collector. The tax collector was usually the richest man in town and treated as a pariah. He was among the most despised in all in the Ancient Near Eastern world. I hope you appreciate the exquisite irony in that the writer of this Gospel story was himself a tax collector. He knew what it was like to be treated as a social pariah. Apparently Matthew thought that much more than wealth belonged to God. The encounter he had with Jesus turned his whole life upside down. He found his reason for living. He discovered what Justice and fair play meant. He found forgiveness, reconciliation. Above all, he found the love of God. In Matthew’s Gospel, we are told the Parable of the Laborers in the Vineyard. Apparently there were those standing idle early in the morning, and the landowner put them to work for the agreed daily wage. Likewise at 9 o’clock he went out and there he found more standing idle. Again he agreed to send them out to work and pay them fairly. He went out at noon and at three in the afternoon and he put them to work with the same promise of a fair wage. Finally at 5pm he still found those standing idle and put them to work again agreeing to pay them what was fair. When the time came to pay the laborers they all got a full day’s wage. A storm of protest erupted, since those who had worked the whole day could not understand why they would not be paid more than those who had only worked an hour. There are way too many standing idle in our inner cities, our rural areas and in the hot bed of conflict in the Middle East. Such idleness will give rise to crime, drugs, and international terror. 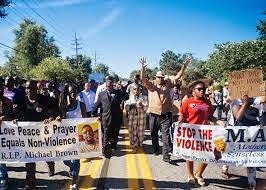 To my way of thinking there is a connection between the unrest we have seen this summer in Ferguson, Missouri, and other urban and rural areas of America and international terrorism. If we let our young people stand idle in the marketplace, a vacuum will be created that is worse than slavery. It is the vacuum of hopelessness. Nature abhors a vacuum. It must be filled with something. Domestically it seems to be filled with crime and drugs. Internationally it seems to be filled with the hope of heaven given in the delusional teachings of ultra radical Islamic terrorism. Obviously Moses, Jesus and Mohammed abhor slavery, injustice, and violence. All three believed and taught that God is the creator, the Law Giver, the All Loving and the All Merciful. The Great Souls all teach us of The Dream of God. 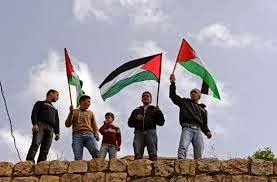 A dream where there is Freedom with Law, Justice, Mercy and above all, a Love between and among brothers and sisters. I think this is what Paul was trying to say in today's Epistle. That's what it all boils down to; "Love one another"! This is our Dream too. The Dream will not come true until we Proclaim the Gospel of God's Love with courage and determination. This is the Dream of God.